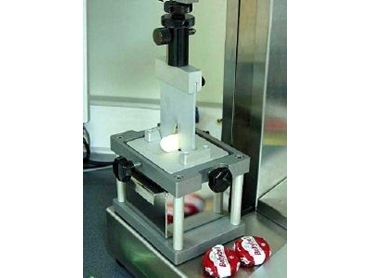 DESIGNED specifically for the food industry, the Hounsfield H1KF, available from PCS Measurement , is used for testing 'texture profiles' (TPA - texture profile analysis). Constructed from food grade stainless steel, the Hounsfield H1KF is suitable for installation and use in any quality control/research laboratory. Depending upon the customer requirement and testing needs, will depend upon the testing attachments supplied. As standard, produce for testing would include the following industry or food types: dairy, fish/meat, vegetables, chewing gum/sweets, creams/emulsions, bakery produce, fruits, and cereal. The H1KF can also test other products such as medical or packaging materials (up to 50kg force). QMAT Texture Analysis software enables results to be easily calculated and stored/printed or compared. Even complex analysis such as SPC (statistical process control) can be performed. * Kramer shear cell. This cell causes the material under test to be subject to Compression, shear and extrusion. The bottom plate is slotted so the material can extrude through it and the blades longer then the holding chamber so they can be pushed through the bottom slates. The number of blades used seems to vary and 5, 7 and 10 have been reported. The number chosen dependent on the characteristics of the material under test. It is used for multi-particle products like cereals, pickles in sauce, pie fillings. It is also used for pastes, cooked rice, beans and pulses. * Ottawa cell. This consists of a loose fitting plunger that extrudes material through a box plate. The base plate may be 3mm bars, holes, and thin or thick blades. It is used on a verity of foodstuffs including meats, fish, cereals, fruits and vegetables. One particular application is the tenderness of fresh picked peas. If the base plate is replaced by a solid plate the device can then be used for back extrusion pulses. * Warner Bratzler shear unit. Used to determine the visco-elastic properties of meats. A cylindrical specimen is taken from the meat and cut through by a triangular blade. Different angles are used depending on the diameter of the specimen. Various apex angles have been quoted 30º, 50º, 60º and 70º. Flat plates without any cut out and square cut outs are also used. Although originally devised for meat testing it is also used for pasta, vegetables, fruit, cheese, fish etc. * Volodekevitch bite unit. This device is meant to imitate the biting action of the human mouth. It consists of a 10mm wide blade with a 3mm diameter end pieces top and bottom. Primarily used to determine the toughness/tenderness of meat it is also used for the fibrousness of vegetables. It is also used for cereals, dried fruit, etc.